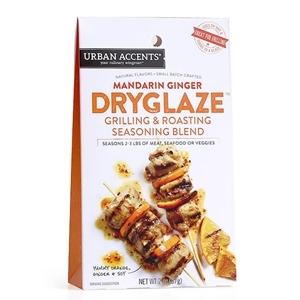 Mandarin Ginger Dyglaze is a complex seasoning blend that combines traditional Asian flavors of ginger and wasabi with orange and demerara sugar to create a yin-yang sensation of flavors bound together with sea salt and peppery citrus flavors. Delicious on chicken, seafood and tofu. Ingredients: Brown Sugar, Sea Salt, Dehydrated Carrots, Soy Sauce Powder (Soy Sauce [Wheat, Soybeans, Salt], Maltodextrin, Salt), Ginger, Dehydrated Orange Peel, Anise, Dehydrated Garlic, Horseradish, Citric Acid, Mustard, Natural Flavors (Extracts of Anise, Ginger, and Orange Oil), and less than 2% Silicon Dioxide for anti-caking. Contains: Soybean, Wheat, Mustard.